The American bishops of the Catholic Church assembled in Baltimore this week for their annual meeting. And they were clucking and fluttering like a bunch of hens, trying to calm the tizzy kicked up by Pope Francis and his kindler, gentler approach to the culture wars. Last month, Francis convened a (relatively) freewheeling synod on the Church and the Catholic family. Among the topics discussed: what to do about gay parishioners, as well as divorced couples seeking to remarry. (Which is technically impossible, unless you get an annulment first.) This has thrown some of the faith's more conservative believers into a bit of an uproar and so, the AP reports, the topic got quite a lot of airtime at the meeting. Cardinal Timothy Dolan, for instance, said the synod was actually a "a synod of consensus" and the pope's great at "attentive listening." In other words: Don't worry, pals, we're not about to be swarmed with hippie-dippy gay divorcees handing out condoms to school kids! And archbishop Joseph Kurtz insisted that there's nothing new and crazy here. Remain calm! All will be well! Kurtz cited his home visits to parishioners, where he wouldn't give them "a list of rules to follow firsthand," but would instead "spend time with them trying to appreciate the good that I saw in their hearts," before inviting them to follow Christ. "Such an approach isn't in opposition to church teachings. It's an affirmation of them," said Kurtz, who attended the Vatican gathering. "They've got a new pope who has an unusual program — new and different," said Russell Shaw, a former USCCB spokesman and a columnist for Our Sunday Visitor, a popular Catholic weekly. "They're just as aware as anybody that the perception of the pope's program has caused a terrible ruckus in the church in the U.S.," he said. 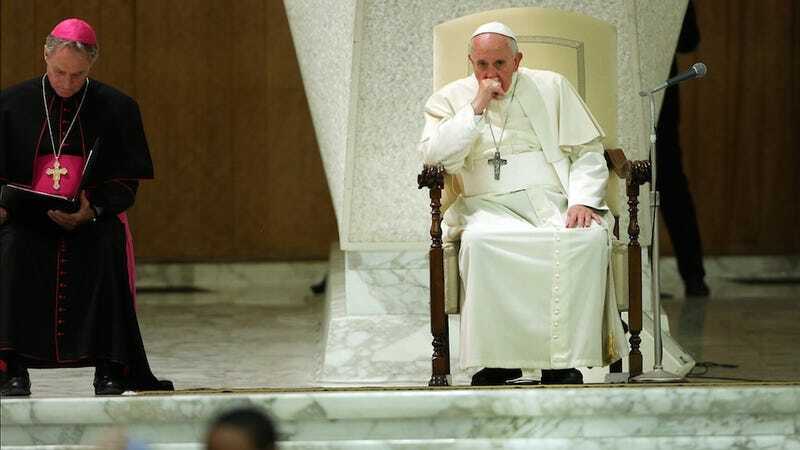 "So they find themselves in the very difficult position of moving forward with the pope's program while reassuring people that nothing fundamental is changing or will change in the doctrine of the church. He said an in interview that Catholic church leaders and lay people, as well as those outside the church, are reacting strongly to the Vatican meeting because they aren't accustomed to addressing issues the way Francis advocates. "The pope made it clear doctrine would remain untouched," Rosica said. He added that the Pope is "is traveling at high altitude," i.e., rising above the haters. As a very wise woman once said: No more drama in my life.